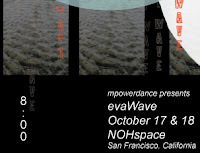 evaWave is a visually compelling dance performance with multimedia effects. Collaborators include: Sasha Silveanu, Allyson Seal, Lena Venable, Josie Iselin, Richard Power, Denise Silver and Peggy Tahir. evaWave celebrates the binding of life and the tender wisdom that moves us toward healing and balance. evaWave is a palindrome, wherein the beginning and the end have the same possibility as a starting point, and where the elements of the first half compliment their opposites in the second half. It is the first staged production of “Dance Echo In Reverse”, the MPOWERDANCE Global Dance Project for 2015.
evaWave is also the first benefit production for the Mpowerdance Project. Your financial support furthers development of its Global Dance Project—a virtual choreographic offering that connects small communities, both locally and globally, through dance and media. The Mpowerdance Project provides dance training process and performance opportunities for collaboration between dancers, artists, writers, and filmmakers. 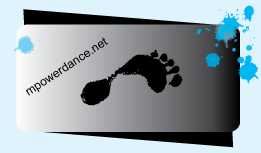 Independent Arts and Media fiscally sponsors Mpowerdance Project, making your contributions tax deductible.